Bust Loose Presents, our 4th annual Ball Crawl! We've got a Dawg-day-afternoon planned as we take a couple of buses hostage and head down to Seaman Stadium to watch The Lethbridge Bulls take on The Okotoks Dawgs in a good ol' fashioned slug-fest! Whether you're a baseball fan, or just love spending a great afternoon out drinking in the sun, this crawl is for you! The Bust Loose! 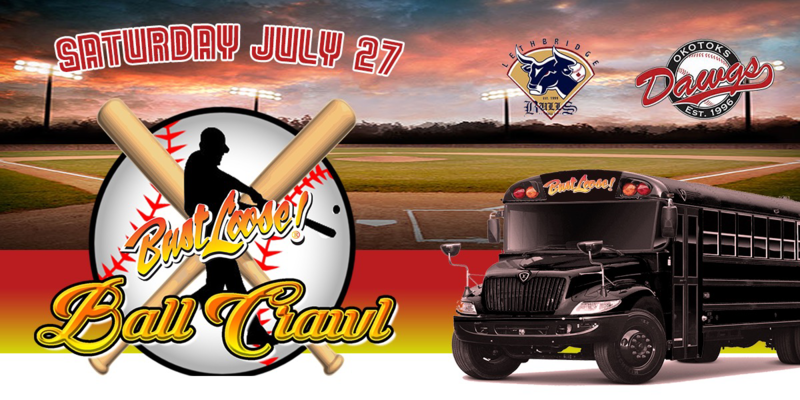 Ball Crawl includes transportation aboard our Party Machine party buses. These mobile party-makers include reconfigured seating, tinted windows, booming stereo systems, mood lighting, and dance poles to create an awesome party experience between venues. $10.00 optional food and beverage add-on includes a burger or hot dog, bag of chips, and a pop. Buy your early bird tickets before the deadlines and save! - BECOME A FAN OF BUST LOOSE ON FACEBOOK OR FOLLOW US ON TWITTER! - Buy 15 tickets and the 16th is FREE! For every multiple of 16 tickets that you order, we will give you the 16th FOR FREE. That means you get 16 tickets for the price of 15, or 32 tickets for the price of 30, or...Well, you get the idea. Orders cannot be cumulative - meaning that to get your FREE ticket(s), you must purchase them all at the same time. BustLoose.com's online ticketing system will discount every sixteenth ticket automatically.